Abraxas is now projected to generate $10 million in positive cash flow in 2019. It received a $17.5 million borrowing base increase and is projected to have $48 million in liquidity at the end of 2019. Abraxas updated its type curves, showing very strong Bakken RORs, and mediocre Delaware Basin RORs. It needs to make substantial progress in reducing Delaware Basin completed well costs before it runs out of Bakken inventory or sells its Bakken assets. Improving oil prices and an increase in its borrowing base have resulted in Abraxas Petroleum (AXAS) developing a decent liquidity cushion (projected at $48 million at the end of 2019). Abraxas needs to reduce its completed well costs for the Delaware Basin though, as there is a sizeable gap in type curve RORs between its Bakken and Delaware Basin assets. Abraxas's Bakken inventory is potentially down to a couple of years (and it also is contemplating a sale of its Bakken assets). Abraxas's capital efficiency will take a substantial hit if it is forced to rely on the Delaware Basin for most/all of its development program if it doesn't reduce costs first. Oil prices have continued to increase, pushing 2019 WTI strip prices above $61. This could result in Abraxas generating around $169 million in oil and gas revenue before hedges in 2019. Abraxas has 54% of its oil production hedged at $56.85 per barrel, which contributes (along with its basis differential hedges) to its hedges having around negative $10 million in value currently. In this scenario, Abraxas is projected to have around $149 million in cash expenditures, leading to an expectation for positive $10 million in cash flow during 2019. Abraxas had $180 million in credit facility borrowings at the end of 2018, so if it can reduce that by $10 million, it will end 2019 with $170 million in credit facility borrowings. Combined with its borrowing base increase from $200 million to $217.5 million, this gives Abraxas a bit more breathing room, resulting in liquidity going from around $21 million at the end of 2018 to a projected $48 million at the end of 2019 (assuming no additional changes to its borrowing base). Abraxas has provided some updated type curve info, which has resulted in some downward revisions of total EUR and a $0.3 million increase in completed well costs. However, there have also been upward revisions in terms of oil percentage, total oil EUR, and initial production rates. The changes to total EUR range from 0% to -6%, while the changes in oil EUR range from 0% to 6%. 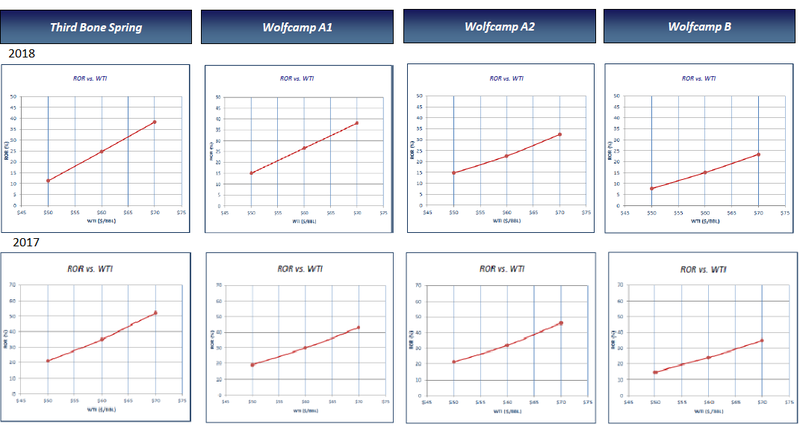 The increase in completed well costs for the type curves is driving down Abraxas's type curve ROR. 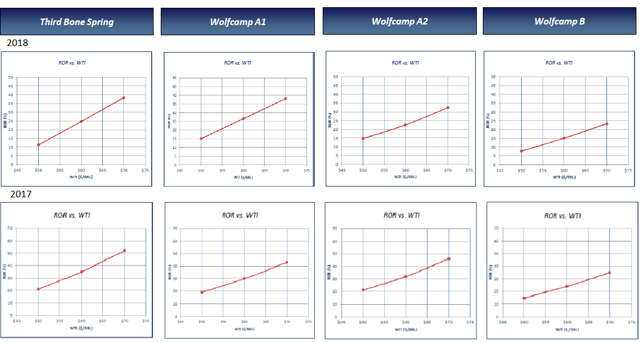 The year-end 2017 type curves claimed RORs of approximately 30% to 35% for the Third Bone Spring and the Wolfcamp A1 and A2 (average of approximately 32%) at $60 WTI oil. This appears to have come down to an average of approximately 25% at $60 WTI oil with the year-end 2018 type curves. Abraxas's actual results still look somewhat better than the updated type curves, so its actual RORs may be better than 25% at $60 WTI oil. However, RORs in the upper 20s or low 30s at $60 WTI oil would still be mediocre. 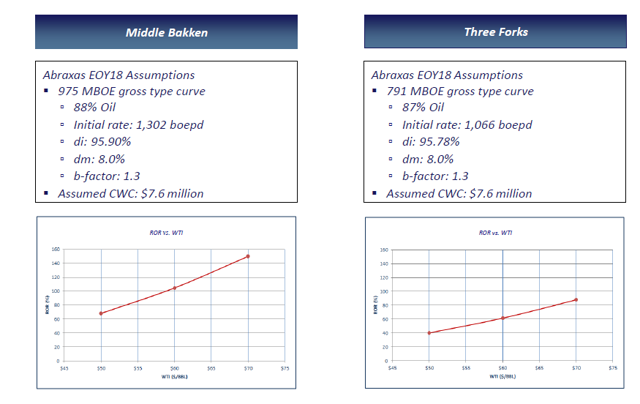 For comparison, Abraxas's updated year-end 2018 type curves for the Bakken shows over 100% ROR at $60 WTI oil for the Middle Bakken and around 60% ROR at $60 WTI oil for the Three Forks. So, it is quite important (especially if Abraxas sells its Bakken assets) for Abraxas to make substantial progress in driving down costs in the Delaware Basin. Getting its well costs down to under $7 million for the Delaware Basin would probably make its RORs okay at $60 WTI oil. Higher oil prices should allow Abraxas to generate around $10 million in positive cash flow during 2019 at current strip prices. The positive cash flow and the borrowing base increase should give Abraxas some breathing room in terms of liquidity and reduce the chances of it doing an equity raise (although that still remains a potential option to reduce its credit facility borrowings). Abraxas does have some work to do in terms of improving capital efficiency in the Delaware Basin before its Bakken inventory runs out (or it sells its Bakken assets). The updated type curves show excellent well-level returns for the Bakken at $60 WTI oil (as well as $50 WTI oil). The well-level returns for the Delaware Basin are currently mediocre at $60 WTI oil though, and Abraxas likely needs to reduce its well costs there to under $7 million in order to get decent returns at $60 WTI oil.